The Bastion of the Brutes was a major Covenant base during the Battle of Installation 05, located in a Forerunner complex near the Installation's Control Room. The Jiralhanae Encampment was located nearby, in another set of Forerunner structures. The Bastion of the Brutes consisted of six sections; an entrance tunnel, a two-leveled room, a massive indoor and outdoor bridge, a prison facility, and a landing pad. During the Battle of Installation 05, the Jiralhanae had taken control of a network of Forerunner tunnels and structures in the region near the Control Room. After being teleported into the area by the Gravemind, the Arbiter, Thel 'Vadam, discovered the civil war that had broken out between his own kind and the Jiralhanae. Assisted by his fellow Sangheili and several other Covenant loyal to them, he made his way through a series of Jiralhanae-occupied caverns and Forerunner structures towards the Control Room. Two Mgalekgolo imprisoned by the Jiralhanae. After regrouping with the SpecOps Commander Rtas 'Vadum, they assaulted the Bastion of the Brutes in order to take control of the Scarab, which they intended to use to gain access to the Control Room, locked by the Jiralhanae who were intending to activate the installation. The Arbiter entered through a series of tunnels leading to the complex. Here, the Arbiter joined with a Special Operations Sangheili and a pair of Mgalekgolo that would aid his attack on the Bastion of the Brutes. The Arbiter and his allies stormed the turret room from the entrance tunnels, emerging on the first floor from the tunnels, charging up the ramp and seizing the second floor by force. A Jiralhanae-operated Shielded Plasma Cannon was on the second floor, as well with Jiralhanae armed with Brute Shots and Covenant carbines. After the Arbiter and his allies wrested control from the small Jiralhanae force stationed there, two further waves of Jiralhanae came to contest their control over the Turret Room from the Indoor Bridge. The Indoor Bridge consisted of two wide platforms on opposite sides of a cave, a yawning maw before them. On the far right side, there was a bridge strewn with gas containers and a Jiralhanae-controlled Shielded Plasma Cannon. The Arbiter came from the Turret Room onto one of the platforms of this cavern, where there were several Jiralhanae stationed and a Battery Crate. He then took the bridge, and assailed the far side. On the far platform, there were Jiralhanae armed with Brute Shots and carbines, and Kig-Yar armed with particle beam rifles and plasma pistols. There were also extensive numbers of Battery Crates on the far platform. The outdoor bridge was guarded by many Kig-yar, one with a particle beam rifle and a swarm of Yanme'e. A Phantom appeared as the Arbiter went across. 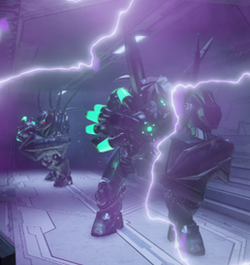 Upon entering the prison room, the Arbiter discovered a Mgalekgolo pair in one prison cell and two Sangheili Councilors in separate cells. The prison was guarded by a pack of Jiralhanae and several Kig-Yar. After freeing the prisoners, another group of Jiralhanae came out of the door at the end of the prison. From the exit of the Prison room, the landing pad was next. A Scarab was stationed there, as well as many weapon crates. The pad had room to hold several Banshees. It also might have served as an execution area, as several Marine prisoners were going to be killed there. After defeating the Jiralhanae in the pad, the Arbiter made an uneasy alliance with Sergeant Avery Johnson who had gained control of the Scarab, in order to stop Tartarus from activating the installation.